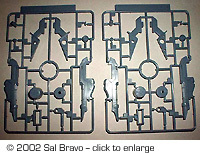 ^ Parts are well molded, if a bit lacking in fine detail. (Jet Black, Faye Valentine, Edward the hacker, and Ein the dog), as they race across the galaxy on daring adventures. They are bounty hunters struggling to survive in a universe that is a strange combination of past, present, and future. With each new bounty that they go after, new characters are introduced, and new cosmic landscapes are explored. 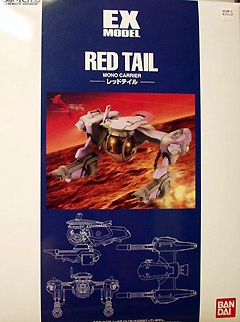 The Red Tail is the personal ship of Faye Valentine and it is the second new Bandai limited-release kit (the first being Spike's Swordfish II) for this anime. Faye's Red Tail is a MONO Carrier with vertical take-off & landing capabilities and heavy armaments (MONO stands for Machine Operation Navigation of Outer space). A variety of equipment can be added in modular form to the ship, making it a flexible multi-purpose craft. In its basic configuration, Faye has it loaded with weaponry, both bought off the rack and customized with her own unique specs. Cowboy Bebop was, at the time of this writing, airing on Cartoon Network's Adult Swim on Saturday nights. The series is also available on video and DVD. 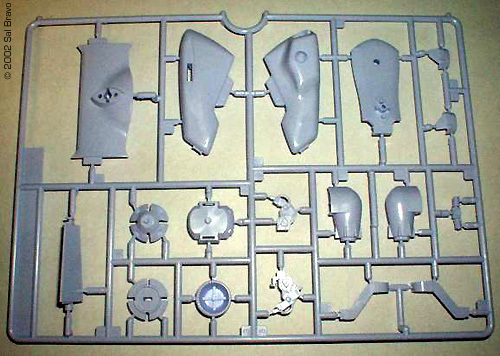 Inside the box you'll find a small sheet of five self-adhesive stickers, the instructions pamphlet, two sprues of light-colored lavender plastic parts, two sprues of medium-gray plastic parts, one sprue of flesh-colored PVC parts and one sprue of clear plastic parts with a golden tint. Typical of today's Bandai kits, there is no flash on the parts that I could see, and the detail is above average. As for accuracy, heck, it looks like the ship from the TV show to me! 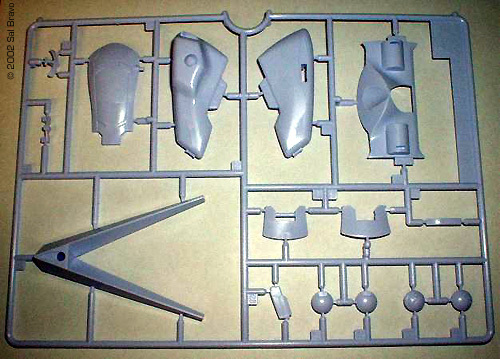 The kit has a removable cockpit pod and sports dual "arms" with gatling guns and missile launchers. 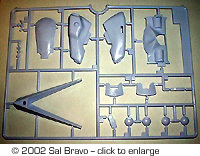 Although I have not done a test fit of the parts, if this kit is like all other modern Bandai kits, there should be little or no seam filling required. 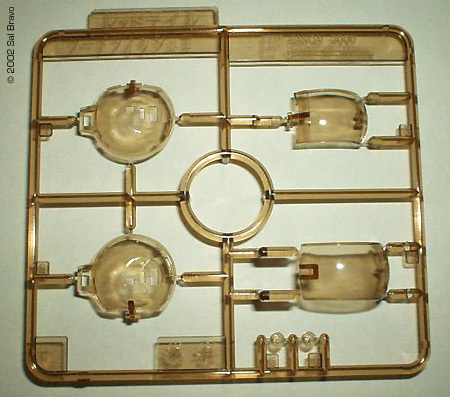 I'm glad that the clear parts are gold-tinted. 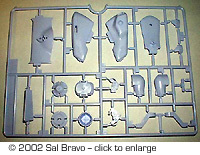 Bandai must have had complains about the clear parts not being tinted on the Swordfish II kit. 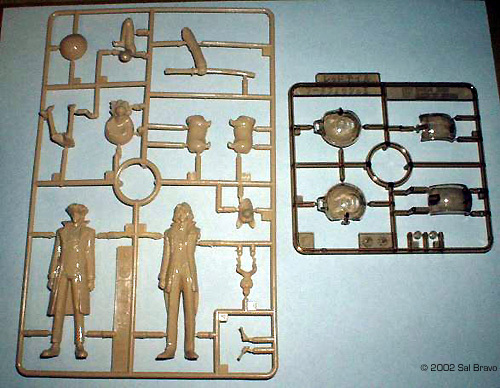 Three large figures of Spike, Vicious and Ed, plus one of Faye flying the ship, are provided on the PVC sprue. Since these do nothing for the kit, IMHO, I will probably discard these figures with exception of Faye's, which goes inside the MONO pod. The instructions leaflet is on black and white… uh, blue and white. It consists of seven steps (plus an optional one) with corresponding exploded diagrams. 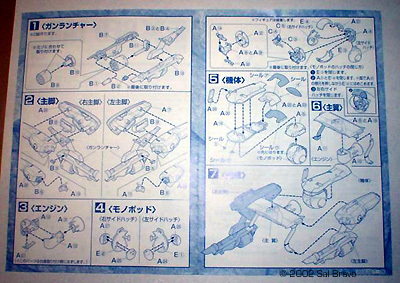 The text is all in Japanese characters although it should not present a problem, with the exception of the paint guide. Unless you can read Japanese characters, you will be using the box pictures as a painting reference. 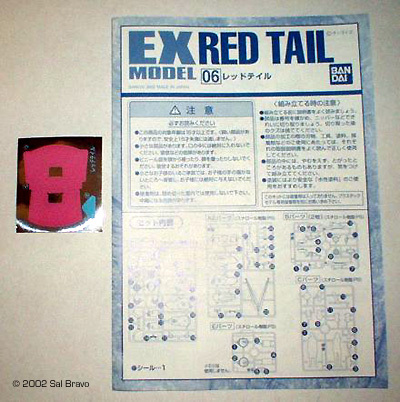 The self-adhesive stickers provided are mainly for a few small markings plus coloring the "tail" of the ship (hence the name Red Tail). I won't be using the stickers since they are inadequate, and will use paint for the markings and the tail instead. Bandai has been putting excellent, easy-to-build kits for a while now, and this one is no different. If you can build a Bandai Gundam kit, you can build this ship. With the exception of a few areas where a bit of mobility is needed, I recommend gluing most of the parts together for sturdiness and ease of seam removal/sanding. 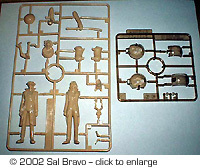 Inexperienced modelers can build the kit as a snap-fast model too. Based on the box pictures, this kit will need wash and some weathering. Overall, it should be a fairly quick project to do, since there are only 3 colors needed with no complicated patterns. The only problem could be the PVC Faye pilot figure, which may be difficult to paint. Of all the ships in Cowboy Bebop, this one is my favorite. You got to love a ship that is versatile, mean and lean, and packs the firepower to back up its reputation. Plus the pilot is a looker. I like the kit and I'm glad I bought it, although it is a shame that this kit had such limited run. My only complain is the overall "hurried kit" impression I get from it, like it was released a bit early before it was ready, which could explain the lame instructions and somewhat bland box artwork. If you like unusual ships and/or like the Cowboy Bebop anime, get this kit. You'll be glad you did. "3, 2, 1, Let's Jam!" Many thanks to Sal's wallet for providing the review sample. Manufacturers and retailers, interested in getting your wares reviewed and publicized on a site averaging 2500+ readers a day? Contact us! This page copyright © 2002 Starship Modeler. Last updated on 17 July 2002.